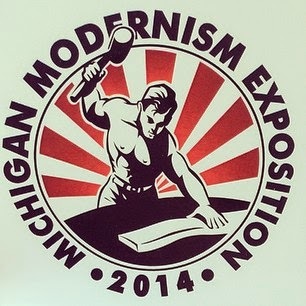 Sorry for the silence around these parts, the last week or so was filled with prep for the Michigan Modernism Exposition held this past weekend in Southfield, Michigan. I had a space that wrapped around the corner of a brick wall, so I utilized the corner by placing my grid walls there -- a perfect way to use a corner to your advantage. Since I didn't have walled space that I could use to further display items, I bought along a screen to hang items from; another great tip for how to get some vertical space at shows. The screen was also helpful to hide extension cords and an unused door. So, I finally invested in one of those nifty foldable shelving units that so many other antique dealers are fond of using. I found this one at a thrift store, but I do plan on purchasing some more because these things are SO handy!! I can't believe I haven't been using these until now! 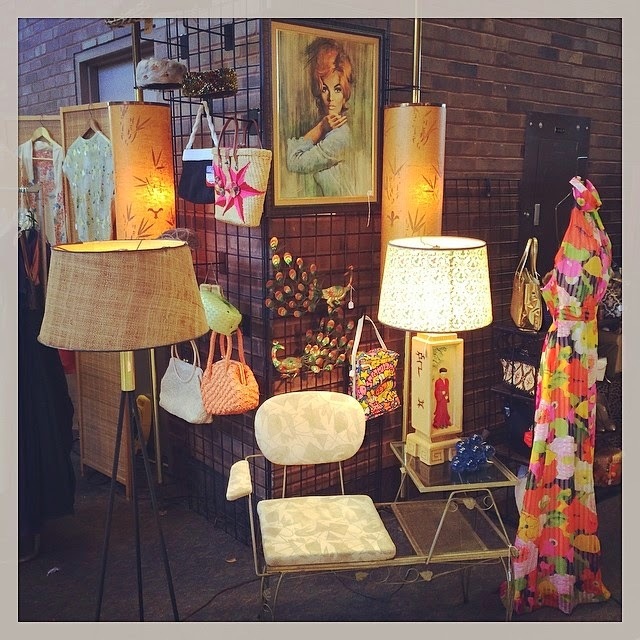 Just a short little recap for now, but look for a whole series on setting up at shows next month! Talking All Things Mad is Back!! That's right! With the seventh season of Mad Men back on that air, I'm back to my weekly podcasts with Tobi of Space Lion. Overall, I really enjoyed the season opener, although I think part of my excitement was induced by the Purple Wedding earlier that evening on Game of Thrones. I like that this season picks up a lot sooner than pervious seasons, eliminating the need for a lot of necessary catch up/back story in the season opener. Tobi links to most of the relevant articles circling on the web, but here are two I recommend if you are looking to get a breakdown on the fashion in "Time Zones." I thought it would be fun to choose one "outfit of the week," spotlighting my favorite look from each episode. This week, the honor goes to Miss Bonnie Whiteside in her fabulous pink and white floral jumpsuit, large ivory bag, and mod white sunglasses. Now this is a look I'd definitely rock! So how are you liking season 7 so far?! Need something to keep the kids busy tomorrow? 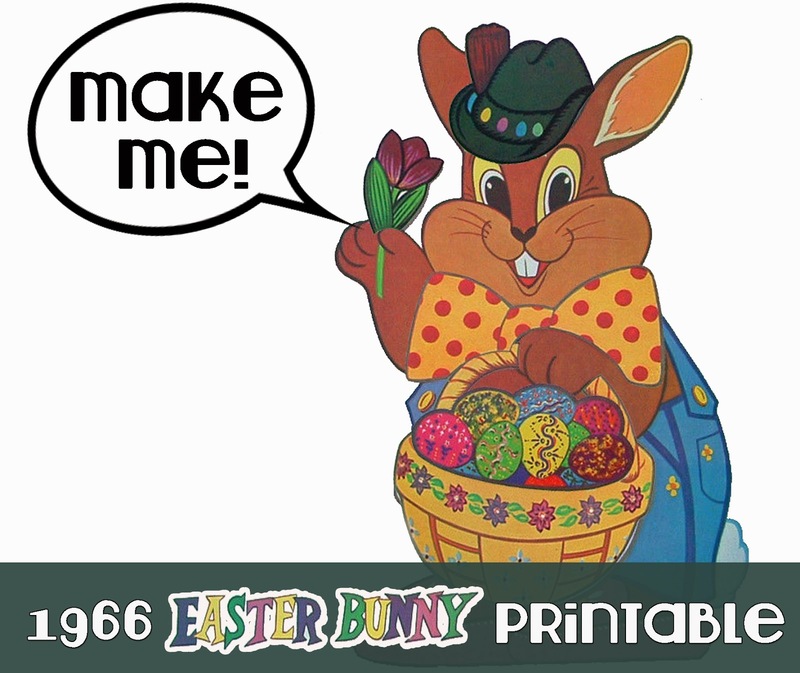 This 1966 Funny Easter Bunny project from Jack and Jill magazine is the perfect craft to keep the kids busy this Easter. I had so much fun putting this guy together digitally! But then again, I loved cutting stuff out and gluing to together as a kid too. Have you decided on what hat you'll be wearing this Easter? If so, then you're probably starting to think about different hairstyles conducive to hat wearing. 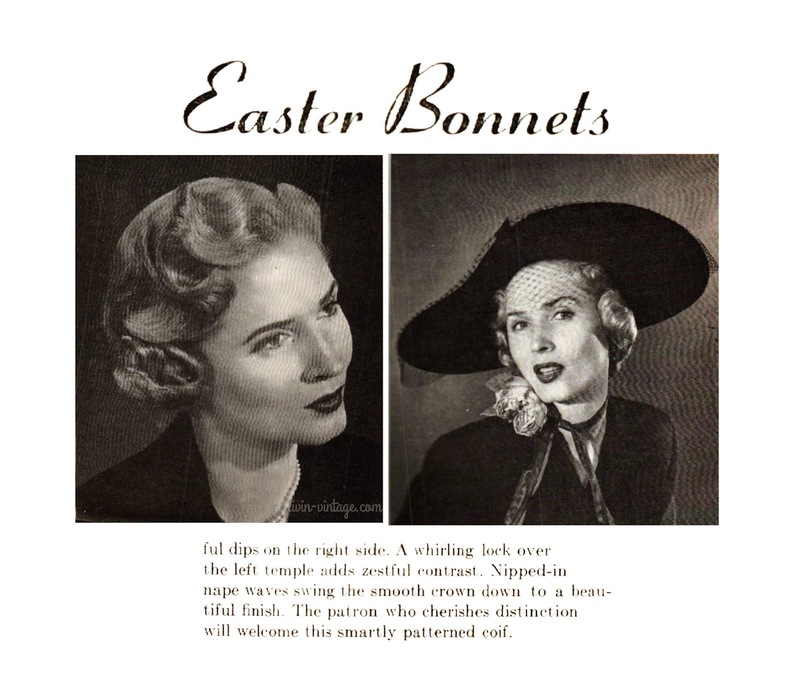 This pin curl set from 1952 is designed specifically for wearing hats, but also looking equally pretty sans hat. 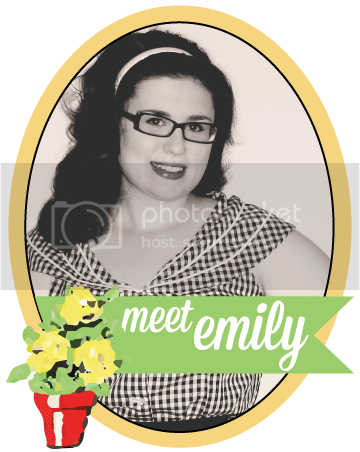 The pin curl set also includes how to comb out and style the look. While the look is best on short hair, I could see this working on longer tresses too. Either pin under to create a faux bob or comb the bottom back U section as instructed for the back of the bobbed look. 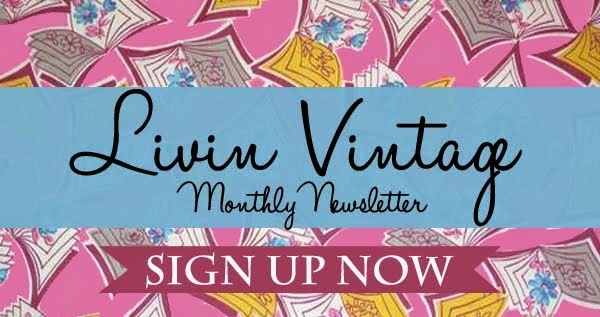 Livin' Vintage Shop on BuzzFeed! So something really exciting happened yesterday! 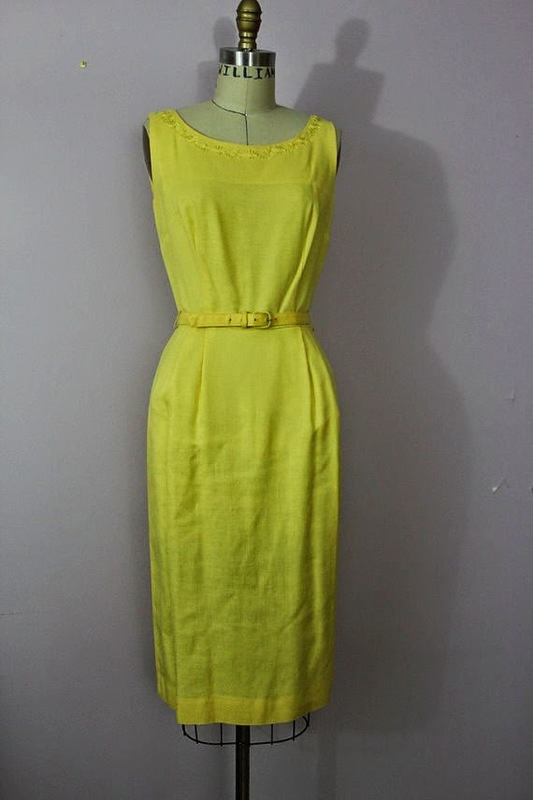 One of my shop's dresses got featured in a buzzfeed article! It's always so exciting when someone you don't know loves one of your items enough that they feature it in an article. Since my business is still young, this kind of press really means a lot! It's been a while since I've done one of these! I miss it! Like much of the Midwest, it's still cold and snowy here in the Mitten. I am really looking forward to spring this year, seeing that Monday night's snowfall broke a 130+ year record for the state of Michigan, bringing in nearly 95 inches of snow this winter. Needless to say, bring on spring! I love these ladies' pants, don't you? I love that they both are using large clutch bags too. I guess it's time to pull out mine and take it for a swing! 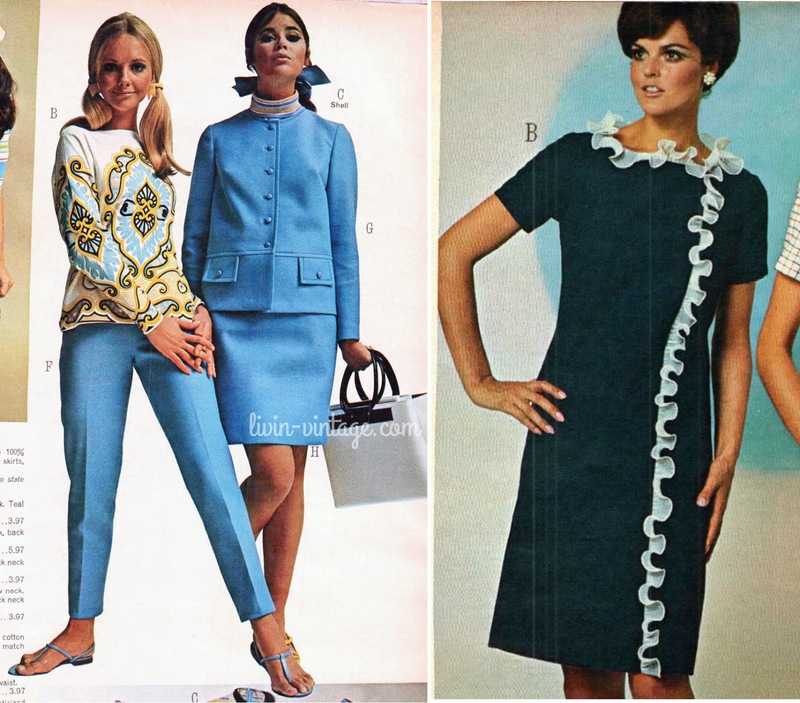 I just adore late 60s hairstyles, so I am really excited to see what direction Mad Men moves this season in regards to hairstyles. From all the studio stills that have been released, it seems that Peggy's character is moving towards less big bouffant hair and more straighter, flatter styles. Conversely, Megan and Betty, seem to still be rocking the big hair, both wearing some of my favorite looks from the era. 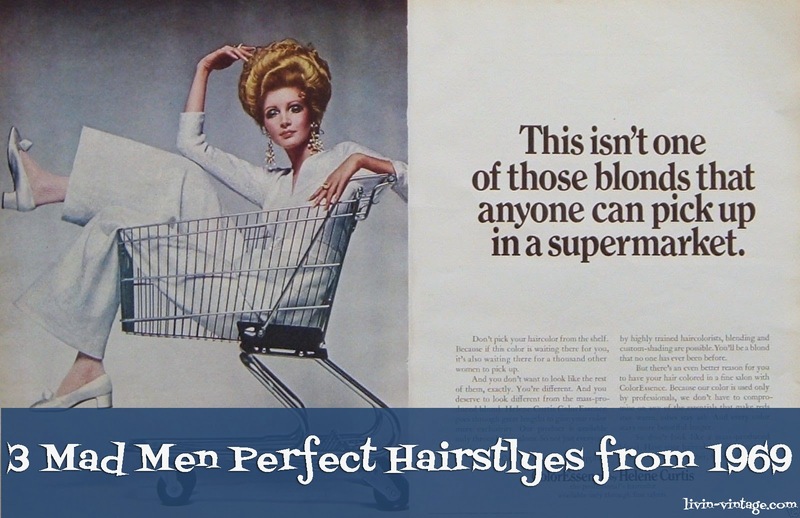 Here are three 1969 hair setting patterns sure to make even the most modern girl look her swinging' 60s best. I think this setting pattern work work well with hot rollers too! 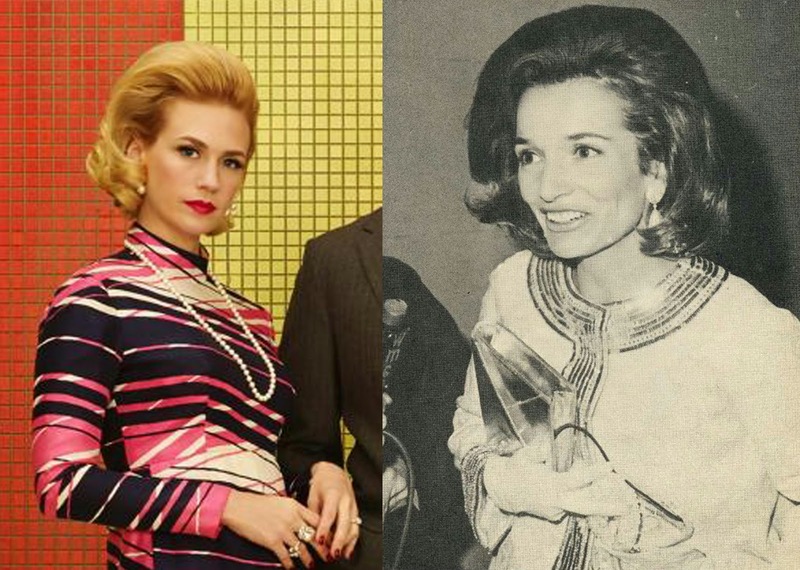 This is one of my absolute favorite 60s hairstyles and January Jones wears it SO well! It's a perfectly polished late 60s politician wife look. While she wasn't in much of last season, this is a style I could totally see Trudy wearing during Season 7. Her character tends to wear her hair half up and this is a much more updated look compared to last season. This is look I could also see Sally wearing. 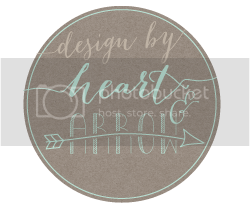 Regardless, it's a great simple style that is easy to accomplish with either a hot or cold set. I'm most looking forward to seeing where they go with Joan's hair. From the beginning, we see her look dominated by a classic up do, and while I don't think much will change, I am hoping for some more winks and nudges to late 60s up dos this season. Click on any of the images to enlarge. All setting pattern images found here. Season 7, more so than any other season, I see Janie Bryant really taking some risks with the mens costumes, especially with characters like Harry and Stan, who have already shown during Season 6 that they are moving along with the times, wearing more of the up-to-date trends while many of the other man slowly eased into the end of the decade. 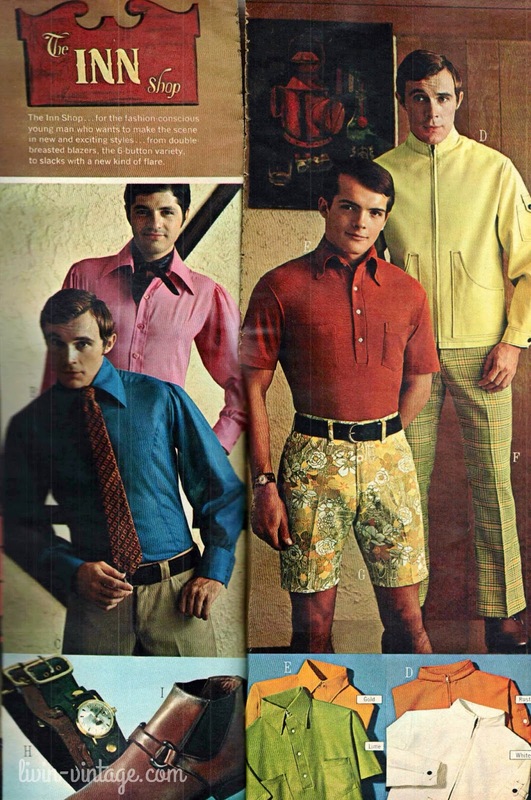 I'm really pulling for one last shot of Pete in shorts -- maybe in a pair like G (yellow and green floral print) above -- allowing his character to come full circle fashion-wise. As you can see from the press release above, it seems that Bryant is sticking with the tight tapered leg pants that have really dominated the series. 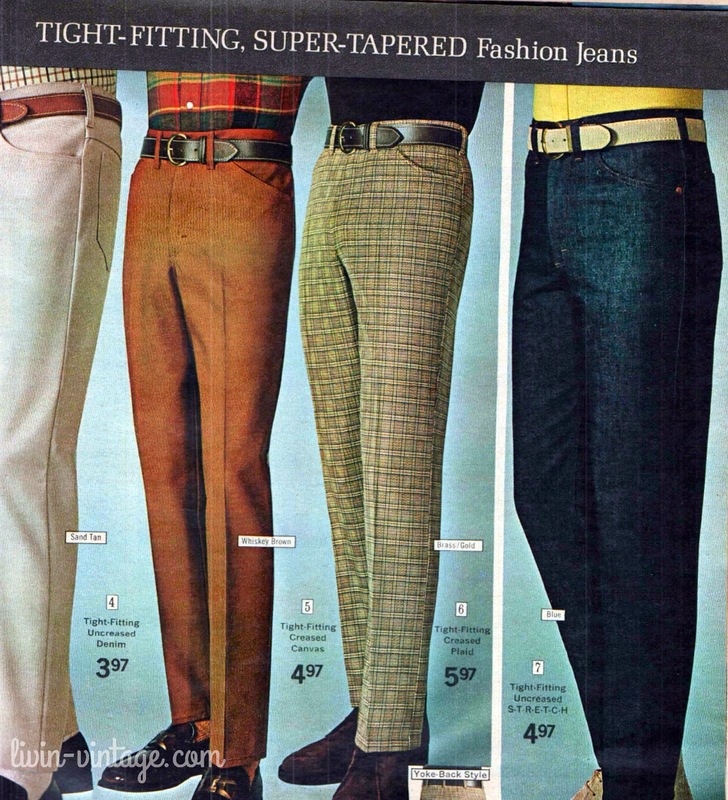 And while this look is prominent in the JC Penny's catalog, I am hoping that the closer the season gets to 1970, the wider the mens pants legs get. Roger is really one of the only "older" men on the show that is pushing outside the normal limits of his character this season and has possibly come the furthest (fashion-wise) from Season 1 (although a just as good argument can be made for Harry as well). 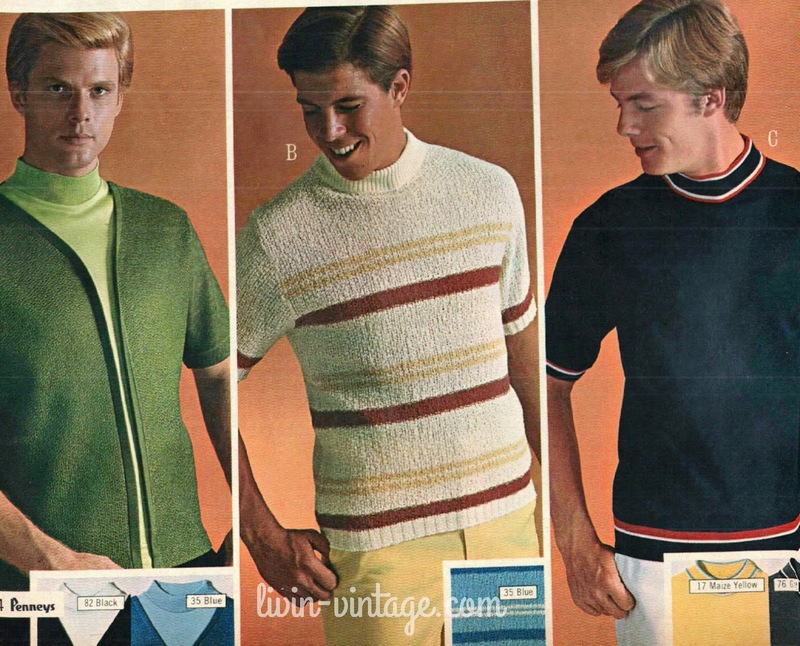 It looks as though he could trade places with the JC Penny's model on the left, demonstrating his ability to keep up with the times. Roger's transformation seems the most fitting between the lead men on the show. Whereas Don is classic, I see Roger as being more trendy, especially after his relationship with Jane. 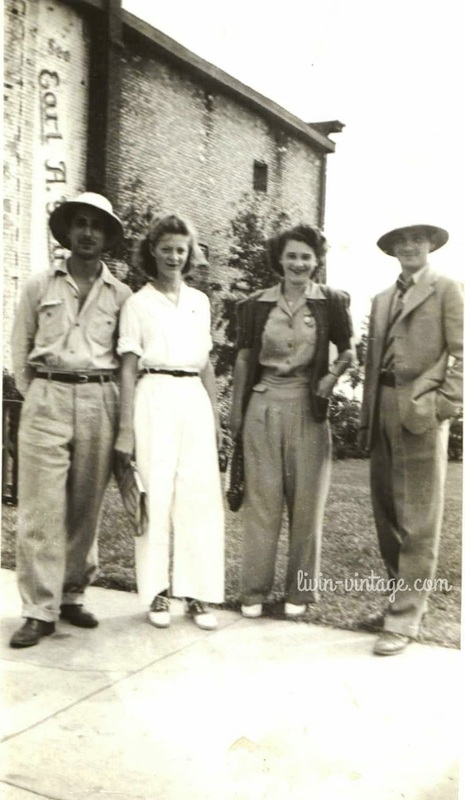 I predict Roger being one of the firsts to exhibit flared bottom pants. 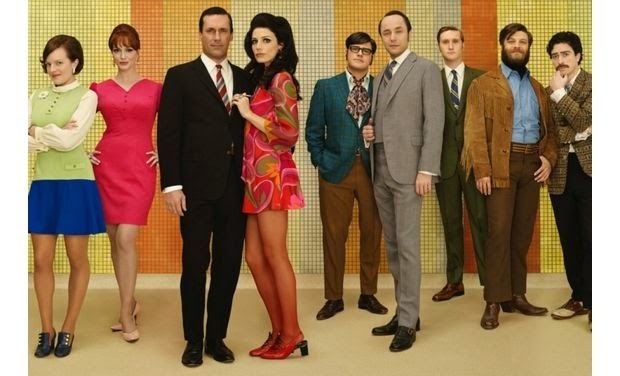 Where do you see the men of Mad Men going this season? 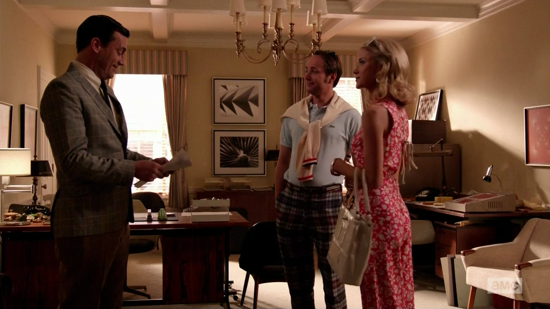 I see Season 7 of Mad Men being one of the most playful seasons yet when it comes to fashion. When we entered Matt Weiner's world seven years ago, traces of the 1950s could be found woven into the tightly constructed 1960 New York. Now that we are at the end of both the show and the decade, there's no better time to really push the envelope when it comes to what viewers are used to seeing each character wear. 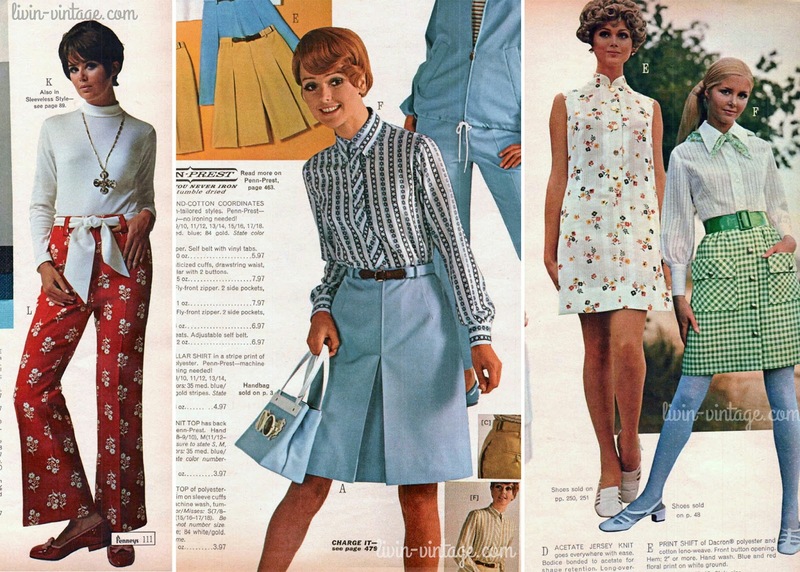 From the press photos, it seems that shorter hemlines, boxed purses, and patterned hosiery will be all the rage for the females of the show this season. The series has found Betty in her fair share of both pants and shorts, so I am looking forward to seeing how/where Janie Bryant takes Betty this season. The yellow paisley print dress has the same feel as the purple one she wears in the press photo, so I'm predicting more prints in Betty's closet this season. Joan is hands down my favorite character and last season I found myself feeling that many of her looks were down right frumpy. 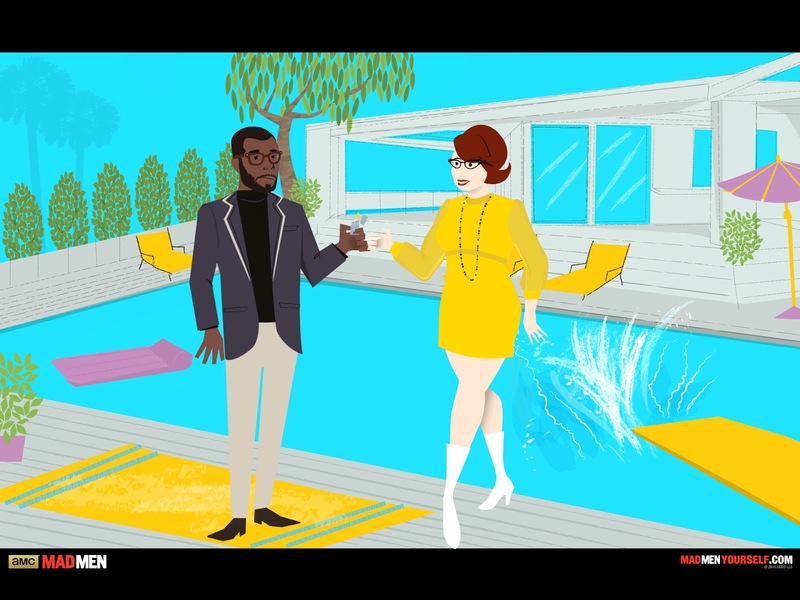 The straight lines of late 60s fashion doesn't do much for Mrs. Harris' figure, but I am hopeful that this season we might see her in some more fashion forward looks that also flatter her curves. The blue dress above is reminiscent of the pink dress she is wearing in the press photos -- that pink is a great color for Joanie. The pink center dress is so curve friendly as is the awesome white shift to the right. I love that this dress (dress c) has a scarf neckline -- very Joan -- while using the big graphic print to create some shape to the otherwise shapeless dress. 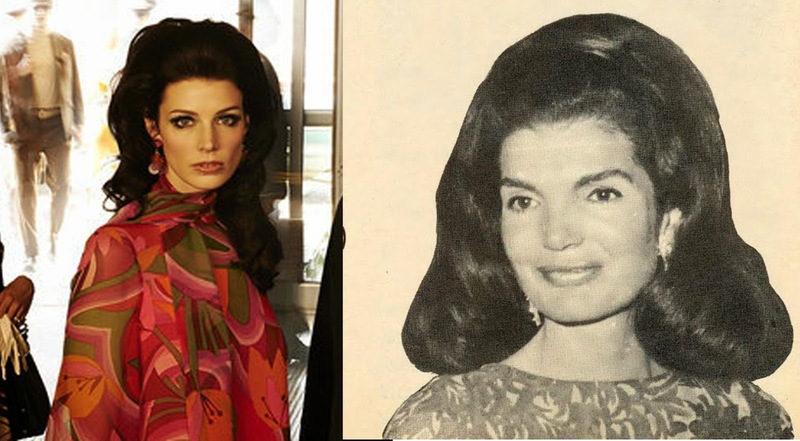 I had to include these two looks -- the second I saw them, they felt so Joan to me. 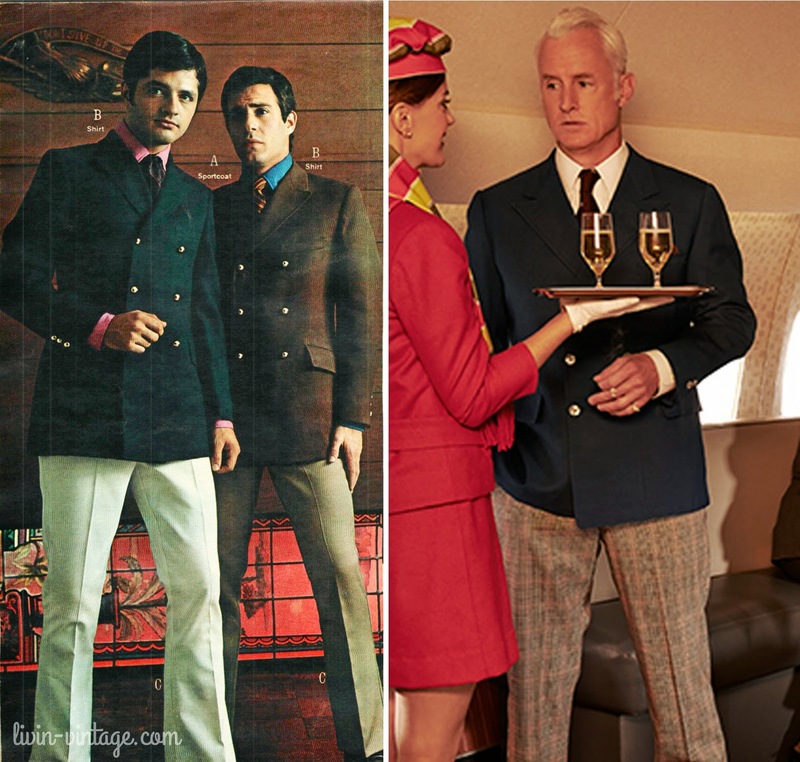 I hope we continue to see Joan in pants this season; I'd love to see a similar look as the one on the left. Janie Bryant has put Joan in a lot of ruffles over the course of the show, so this dress would be a prefect office look for Joan this season. Out of all the characters in the show, I think Megan might be the hardest to predict where she will go fashion-wise. The press photos have her in a psychedelic print dress with colored tights, but I have a feeling this might change the longer her character is out in California. 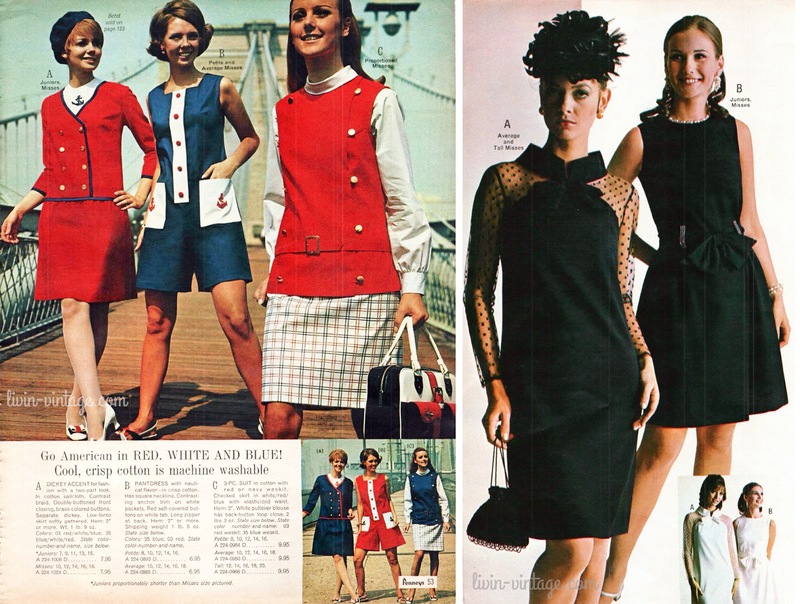 I like that dress a on the left has a nod to last season with the head kerchief and the lacing detail on the bodice. Ultimately, I see Megan moving towards a more bohemian aesthetic by the end of the season. When we left Peggy last season, she was standing in Don's office wearing a fabulous plaid pants suit, signally some seriously changes for the following season. The recent press photos have Peggy back in a skirt, a drop waisted mini skirt! This is a fun look for Peggy, however, I can't help but feel it is slight more juvenile than some of her previous outfits, especially the one we are left with at the end of Season 6. Peggy's character has always been big on separates, a trend I see continued into Season 7. I also am hopeful for more pants in her life. It's a good look for Peggy and a way to outwardly express her desire to be considered an equal in the workplace. I have to say, just based on the press photos, I am a bit surprised to see where the women's fashion is at so far this season -- it still feels very Season 6 to me. However, as with every season, I am thoroughly excited to see where Janie Bryant takes us. She is truly one of the most talented costume designers working in the industry right now. 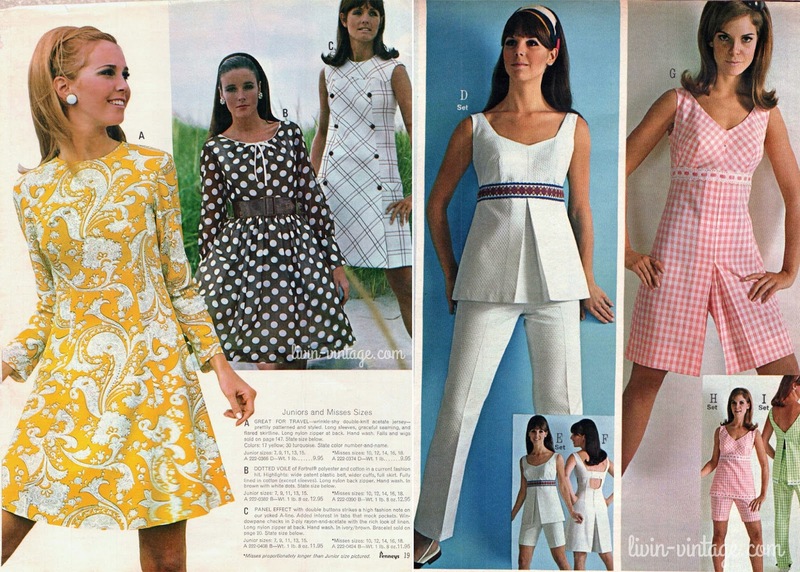 Check back on Friday for more 1969 women's fashion! 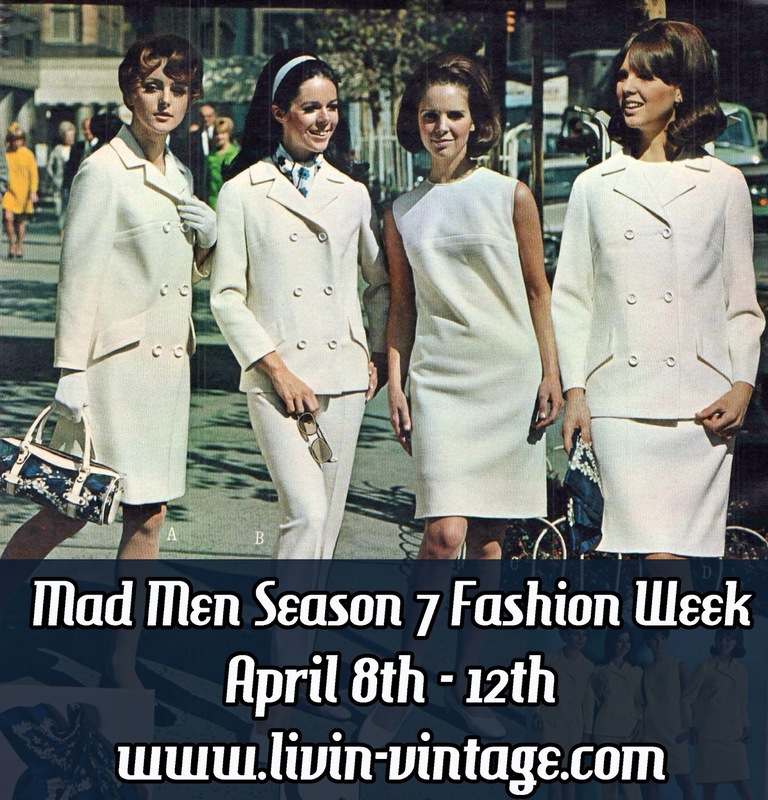 The wait is nearly over for Mad Man fans -- season 7 is almost here!! 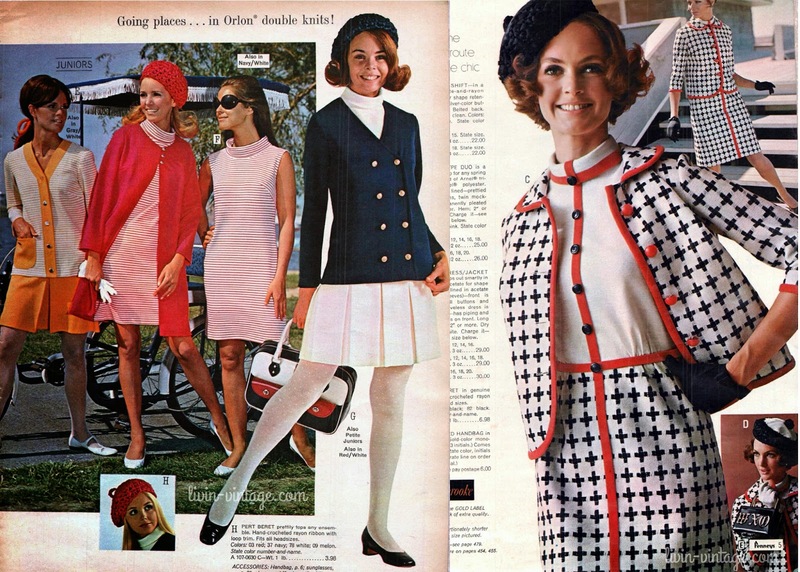 Until the big season premiere on Sunday, I'll sharing TONS of 1969 fashion inspiration from fashion magazines, catalogs, and the like; as a way to forecast where Mad Men is going and to get into a swingin' 60s mood. Check back tomorrow for a look into 1969 via the Spring Penny's Catalog. 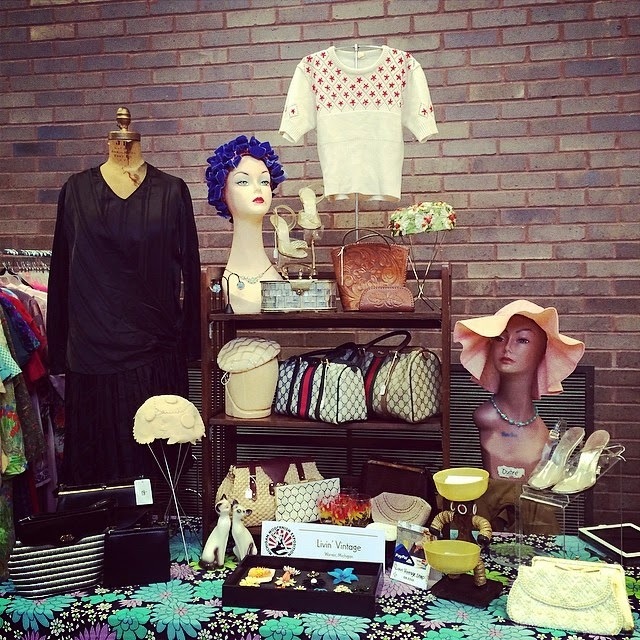 Last week, one of the ladies at the post office I frequent mentioned that her daughter was working on a project about 40s fashion. 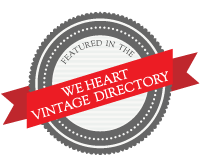 I thought that was SO exciting and offered to send her some scans from my library of vintage magazines. 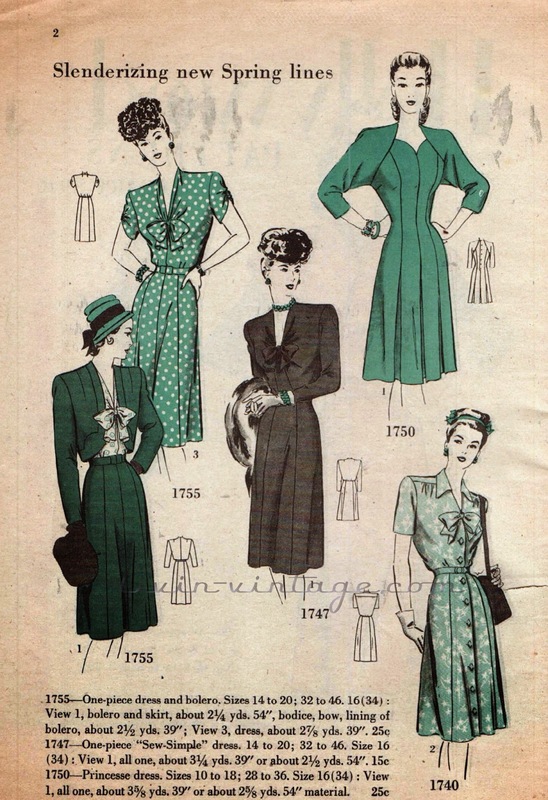 This Spring 1946 Hollywood Pattern booklet was among some of the things I scanned in. 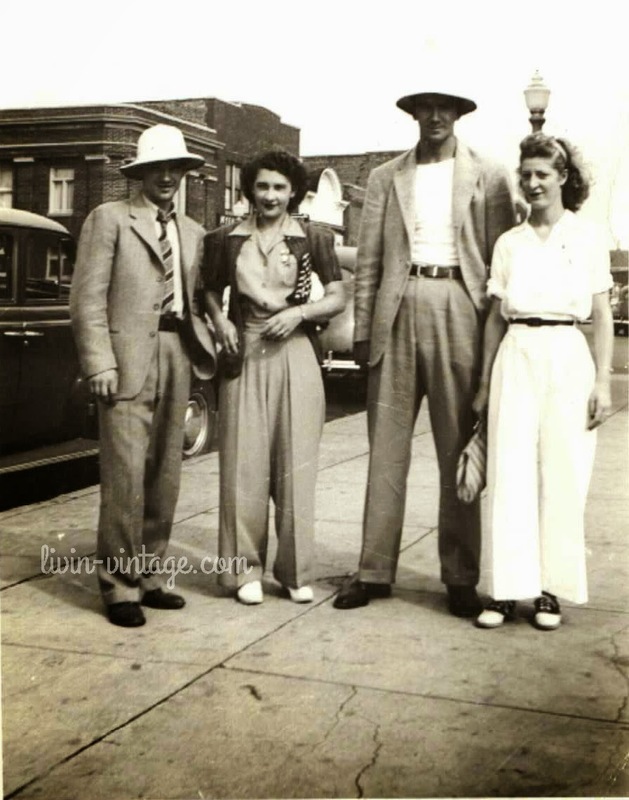 I liked that it hit on a few of iconic 40s trends, such as large shoulders and tilt hats. 1755 and 1750 are my favorite looks from this page. What are yours? 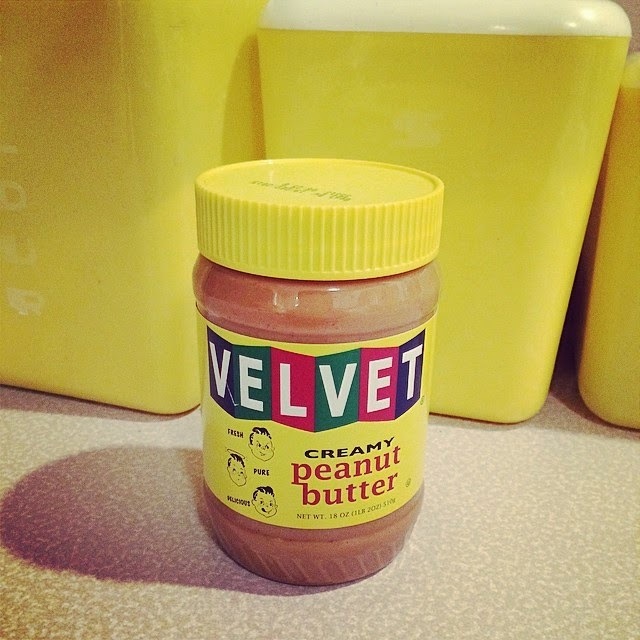 How cute is this peanut butter? When I spotted it this past weekend grocery shopping I knew I just had to get it. It didn't hurt that it was made here in Michigan! Last week I went down to Ohio for a bit of antiquing and came home with a few goodies for both me and the shop. I am such a sucker for old store displays/packaging! This sweet box was only $3! 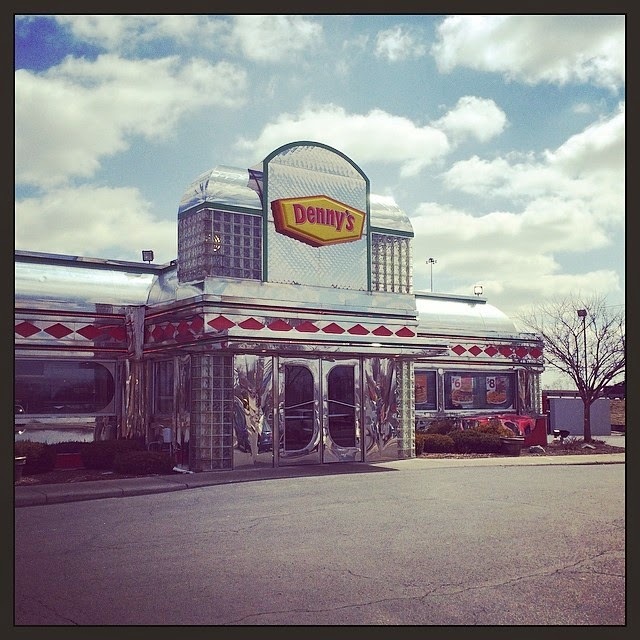 Stopping at this cool retro chrome Denny's for lunch that day was a must! Listening to some Hey Jude on a rainy morning. 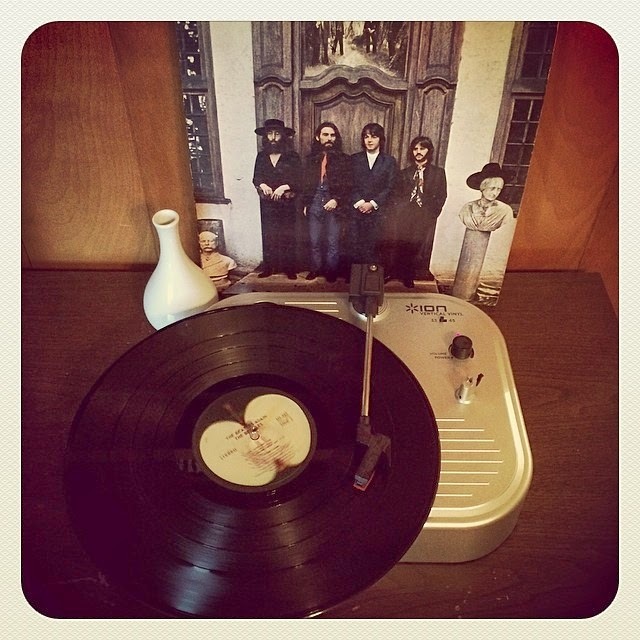 Nothing like a cloudy day and the crackling of vintage vinyl! 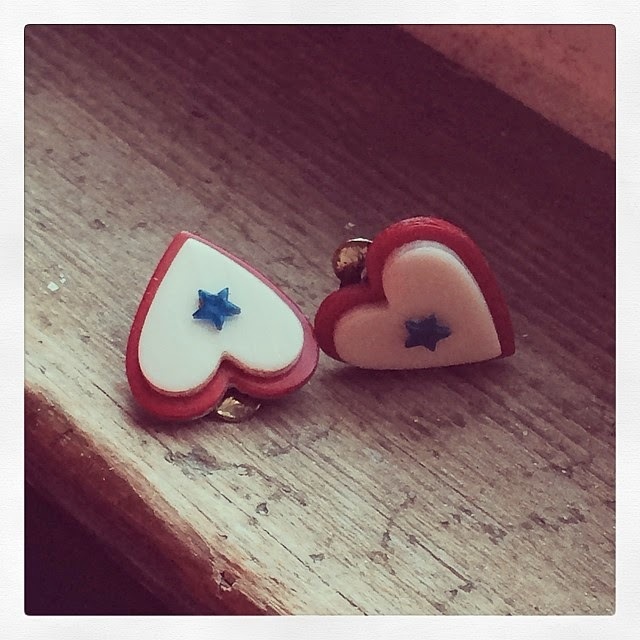 My latest addition to my WWII sweetheart jewelry collection. This will look so cute with some bakelite come 4th of July!